WASHINGTON — Judge Brett Kavanaugh’s life seems as carefully constructed as the Supreme Court arguments he will hear if he is confirmed to the high court. He checks all the boxes of the ways of Washington, or at least the way Washington used to be. He’s a team player — the conservative team — stepping up to make a play at key moments in politics, government and the law dating to the Bill Clinton era and the salacious dramas of that time. Yet in a capital and a country where politics has become poisonously tribal, Kavanaugh has tried to cover his bases, as Washington insiders have long done. He’s got liberal friends, associates and role models. He was a complicated figure in the scandal-ridden 1990s, by turns zealous and restrained as an investigator. If he wins confirmation, he’ll be seated with Justice Elena Kagan, the Obama-era solicitor general who hired him to teach at Harvard when she was dean of the law school, as well as with his prep school mate, Justice Neil Gorsuch. Kavanaugh’s law clerks have gone on to work for liberal justices. He’s served with Justice Ruth Bader Ginsburg in mock trials of characters in Shakespeare plays, a night out from the real-life dramas. Amateur athlete, doer of Catholic good works, basketball-coaching dad, Yale degrees, progression from lawyer to White House aide to judge — it’s all there in a rarefied life of talent and privilege, though strikingly not one of great personal wealth. The only skeleton in Kavanaugh’s closet that the White House has owned up to is as American as apple pie. Spending on baseball games helped drive him into debt one year, the White House said. He’s also been ribbed for hoarding gummy bears when he worked as an aide to President George W. Bush. Because Republicans are not releasing critical documents for the Senate hearings that begin Tuesday, it remains to be seen if anything else is rattling around. To critics, like Democrats on the Senate Judiciary Committee lining up to question him, Kavanaugh’s collegial disposition is “Much Ado About Nothing” (Kavanaugh’s 2012 mock trial for Washington’s Shakespeare Theatre Company, Ginsburg presiding). “From the notorious Starr report, to the Florida recount, to the president’s secrecy and privilege claims to post-9/11 legislative battles including the Victims Compensation Fund, to ideological judicial nomination fights, if there has been a partisan political fight that needed a very bright legal foot soldier in the last decade, Brett Kavanaugh was probably there,” New York Sen. Chuck Schumer, now Senate Democratic leader, said in 2006 hearings that preceded Kavanaugh’s confirmation as a judge on the U.S. Court of Appeals for the District of Columbia Circuit. With some ideological mashup, Kavanaugh’s judicial record has been conservative in the main, reflecting views that could swing the court right on abortion, gay rights, executive power and more for decades to come. His judicial record since? With some ideological mashup, it’s been conservative in the main, reflecting views that could swing the court right on abortion, gay rights, executive power and more for decades to come. Kavanaugh heads into the hothouse of confirmation hearings representing the hopes of President Donald Trump and the right that he will do just that. One question from senators, whether expressed or implied, will be how far the apple fell from the tree. E. Edward Kavanaugh, 77, was a fixture in the Washington influence game years before Trump began calling it a swamp. Brett Kavanaugh’s dad lobbied for the Cosmetic, Toiletry and Fragrance Association, the national trade group for companies making personal care products. An AP review of Kavanaugh’s dozen years on the D.C. appeals court and his wider public record shows him opposed to a variety of regulations, on greenhouse gases and more, as well as to the structure of the Consumer Financial Protection Bureau established after the 2008 financial crisis, and to administration policies that circumvent Congress and risk “a runaway executive branch.” Yet he is deferential to the presidency, an approach that raises questions about whether he would protect special counsel Robert Mueller’s investigation into possible coordination between Trump’s 2016 campaign and Russia if that matter came before the high court. 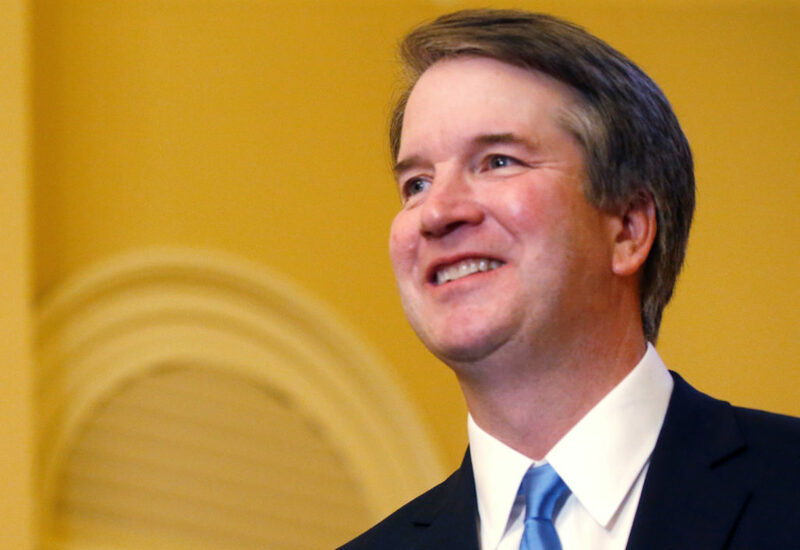 His mother, Martha Kavanaugh, went on to become a prosecutor and state judge in Maryland, where Kavanaugh was raised as an only child, attending Georgetown Preparatory School as Gorsuch did. 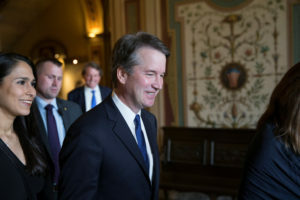 Brett Michael Kavanaugh’s career progression: law clerk for federal appeals judges, fellowship with then-Solicitor General Kenneth Starr, law clerk for Justice Anthony Kennedy (with high-school classmate Gorsuch), associate counsel in the Starr investigation, law-firm partner, Bush White House associate counsel, White House staff secretary, judge. He first dated Ashley Estes, then Bush’s personal secretary, on Sept. 10, 2001; they married in 2004 and have two daughters. He’s from a wealthy family. In 2005 his father earned just over $13 million in compensation and a send-off retirement package as the cosmetic group’s president. But his own family’s finances are apparently modest. Public disclosure forms for 2017 showed only two investments, together worth a maximum of $65,000, along with the balance on a loan of up to $15,000. As well, the White House said he had $45,000 to $150,000 of credit card debt in 2016, some of it from buying season tickets to the Washington Nationals for himself and several friends. That debt was paid off by last year, the White House said, and Kavanaugh was reimbursed for the friends’ tickets. The National Archives has millions of pages of records concerning Kavanaugh and he’s only 53. That’s how plugged in he was in Washington even before becoming a federal judge. Kavanaugh put his stamp on investigations of the 1993 suicide of Clinton aide Vince Foster and the late 1990s Clinton-Lewinsky impeachment episode as a member of special counsel Starr’s team, served on the Republican legal team in the Bush v. Gore election stalemate of 2000 and had a quiet hand in White House national security and terrorism policy in the crucible of 9/11 and the wars that followed. Archivists couldn’t process so many records for release in time for the hearings as Republican lawmakers push to get him confirmed before the November elections that could switch Senate control to Democrats. Altogether, a mountain of material on the Zelig-like Washington player has emerged and an even larger mountain is yet to be revealed. In a vast collection of released emails from his days as a White House aide, humdrum rules. They reveal little more than long nights at the office and the fact that other aides counted on him to advise when Bush’s travel costs should be billed to the Treasury and when they were too political to ding taxpayers. AP’s review of Kavanaugh’s judicial record and decades of his writings and speeches does not illuminate whether he would vote to overturn the Roe v. Wade decision establishing the right to abortion. But his record suggests he would vote to support restrictions. He’s spoken admiringly of Justice William Rehnquist’s dissent in the 1973 Roe v. Wade case, yet recently told a senator that Roe is settled law. In a dissent, Kavanaugh accepted that a 17-year-old in immigration custody had a right to the abortion she wanted. Yet he indicated the Trump administration could delay her abortion while they tried to identify U.S. sponsors with whom she could live and who could counsel her on the abortion decision. A more in-your-face — yet still nuanced— figure emerges in a recently released August 1998 memo to Starr urging that Clinton be asked blushingly explicit questions about his sexual interactions with intern Monica Lewinsky so as to understand a “pattern of revolting behavior” and give Congress more information to decide whether Clinton should remain president. As a lead investigator of the Republican-sparked investigation, Kavanaugh also floated expansive grounds for impeaching a president, a trigger of some concern to Republicans now should an appetite in Congress grow for Trump’s impeachment. But in a memo later in 1998, he recommended the Starr investigation be brought to a close and its findings turned over to the next president. “We believe an indictment should not be pursued while the President is in Office,” Kavanaugh wrote, suggesting this conclusion be reached by his colleagues. The Starr report did bring on Clinton’s impeachment by the House, for perjury and obstruction of justice. The Senate acquitted Clinton and he served out his term. READ NEXT: Where does Brett Kavanaugh stand on business issues and workers’ rights? Kavanaugh was also at the center of one of Starr’s many tangents, the investigation of the death of Foster, Clinton’s deputy White House counsel. In one way, Kavanaugh was a moderating force in that investigation. His ultimate finding, embraced by Starr, was that Foster indeed killed himself, and nothing was found connecting that self-inflicted shot in a Washington-area park nefariously to the Clintons, as the conspiracy theories had it. Yet the mere fact Starr took on that matter and Kavanaugh pursued it gave those conspiracy theories enough credence to persist, which they still do. A decade later, in his 2006 confirmation hearings, Kavanaugh said he came to realize it was a mistake for a special counsel investigation to grow so broad, as if “Judge Starr was somehow the permanent special investigator of the administration.” Such prosecutorial reports, he said, can damage people’s reputations and the credibility of the investigation itself. Associated Press writers Richard Lardner, Mark Sherman and Jessica Gresko contributed to this report.